A small Anthophorid (?) in Phacelia distans. Saw just a few of these, very busy, constantly moving. Will try to get better pictures tomorrow. Scopa seem to indicate that it has been collecting pollen (+?) these Phacelia flowers. Update: Calliopsis (Nomadopsis) acc. to John Ascher (see comments below). Please see also separately posted images of this sp. here: 1 .
and have a good time (and much success) in Belize! Have temporarily parked this under Calliopsis . I've posted two images separately that show the abdominal pattern better. I suspect this is a large species of Perdita, though will be interested in what John Ascher determines. 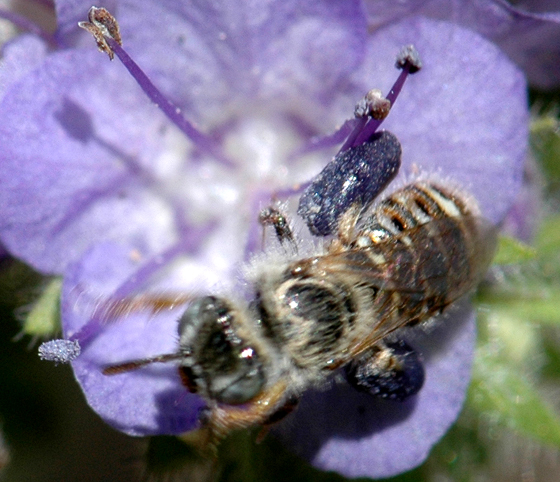 What you are seeing is not the scopa, but a huge blob of pollen and nectar adhering to her hind leg. I have seen many Perdita with just this sort of appearance. (well, big if Panurginae), the polychrome abdomen was obvious even without looking through the lens. It'll certainly be interesting to learn exactly what this is, so I'll try to find it again in the next few days.